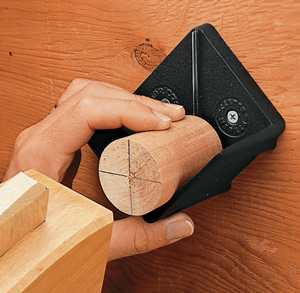 To use the Veritas Center Marker, set a square or cylindrical piece of wood (up to 6" across) on the shelf of the marker, tap it with a mallet, turn the wood 90 degrees and tap it again. The result is two lines scored in the wood, the intersection of which is the exact center. With an irregular piece, turn four times rather than twice and the result will be a small polygon in the middle, the center of which is the center of your work piece. The Veritas Center Marker is made of aluminum with a steel blade that scores the wood, and can be mounted on the wall near your lathe, or on a bench.